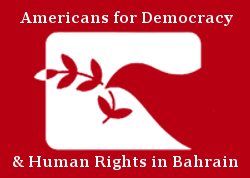 25 August 2015 – Americans for Democracy & Human Rights in Bahrain (ADHRB) strongly condemns the arrest of Dr. Nasser bin Ghaith, an Emirati economics professor and prominent academic. UAE state security forces arrested bin Ghaith on 18 August, reportedly in relation to his recent tweets about Egypt. A week after the arrest, the government still has not revealed his whereabouts, and he remains at risk of torture and ill-treatment. This is not the first time that the UAE security apparatus has arrested Dr. bin Ghaith. In April 2011, state security officers arrested bin Ghaith and four other activists after they petitioned the president to introduce direct elections and grant the parliament more legislative powers. The government tried the group in front of the Federal Supreme Court on charges of insulting the country’s top leadership and endangering national security, ultimately sentencing the activists to between two and three years in prison on 27 November 2011. The day after their sentencing, however, the president granted all five activists a pardon. Shortly after the release of Dr. bin Ghaith, the government once again ramped up efforts to quash dissent. In March of 2012, authorities began to round up and arrest activists who had advocated for political reforms in 2011. The wave of arrests culminated in the detention of 94 people, including human rights defenders, lawyers, judges, academics, and former government officials. The 94 faced ill-treatment and torture while in pre-trial detention. Authorities then tried them in a mass trial that failed to meet international fair trial standards. The government convicted 69 of the 94 defendants, and 61 remain in prison in the UAE. Mohammed al-Roken, one of the convicted defendants, served as the lawyer for Dr. Nasser bin Ghaith and his co-defendants in 2011. The re-arrest of Dr. bin Ghaith serves as yet another example of the UAE’s increasing efforts to crack down on free speech. UAE laws enable the authorities to persecute activists with impunity. Article 176 of the UAE’s penal code makes it a crime to publicly insult top officials and prescribes prison sentences of up to five years for anyone who insults the president. A 2014 counter-terror law uses a vague definition of terrorism to criminalizes acts of free speech, providing severe penalties for declaring “opposition to the State,” professing “non-allegiance to its leadership,” and “prejudicing the national unity.” Additionally, authorities have recently used the nation’s 2012 cybercrime law, which criminalizes online criticism of the state, to arrest and convict those who advocate for the release of political prisoners. In 2013, the government convicted a number of people of violating the cybercrime law by sharing their online support for the 69 people convicted in the trial of the 94. February 2015 saw security forces arrest three sisters of another detainee, Dr. ‘Issa al-Suwaidi, for campaigning for the release of their brother on Twitter. Nasser bin Ghaith’s arrest does not come in isolation; it stems from a systematic campaign against those who dare to engage in public activism. Ensure legal safeguards for detainees are met. Investigate conditions of detention in the UAE. Condemn the continued imprisonment of activists in the UAE and call for the release of prisoners convicted on charges related to free expression.